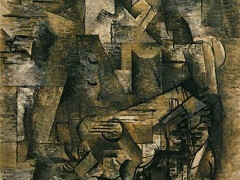 Woman with a Guitar was ainted in 1913 by Georges Braque. A relatively large painting it is 130 cm by 73 cm, and utilised both oil paint and charcoal. 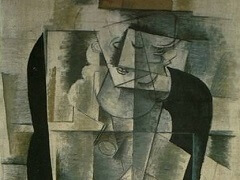 While the painting is abstracted the basic subject can still be seen towards the top in the feminine mouth and eye, as well as the brown trapezoid shape containing the strings of a guitar. 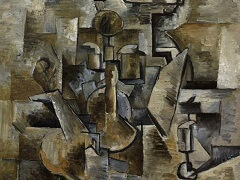 It is an excellent example of Braque's early paintings. 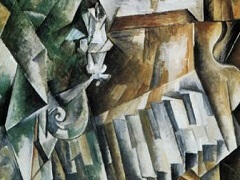 While this image is fractured, it is not chaotic; rather, there are elements which help lead the eye around the painting. 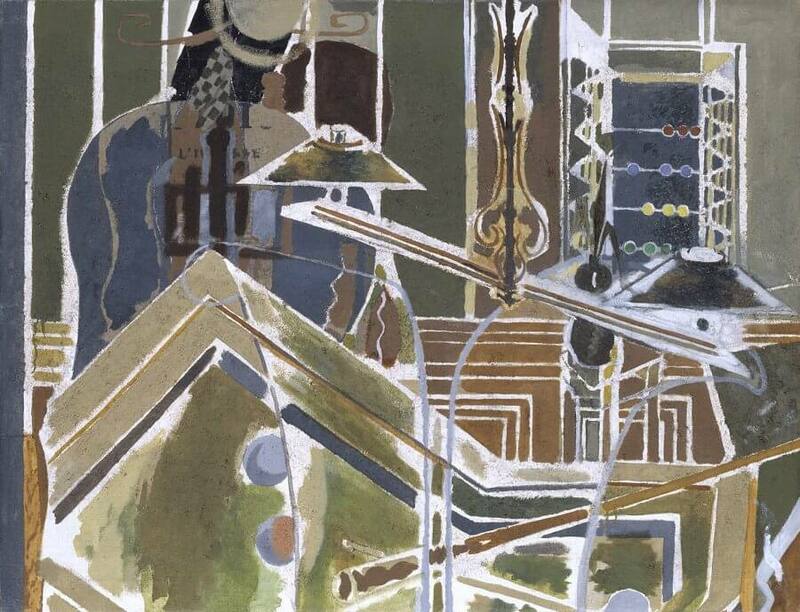 Braque creates visual dynamics through balance. The viewer can see the brown of the guitar, balanced at the top by the inclusion of a brown rectangle. By the same token the dark area to the right of the painting, in what could possibly be a stylised shoulder, is balanced by the same colour on the left. 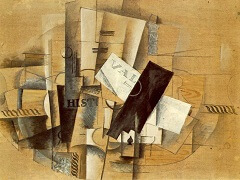 Braque has also used multiple intersecting cross shapes throughout the image to create harmony across the composition. The two most obvious are in the centre of the woman's abstracted shape and repeat throughout the image. Each individual plane in this composition has a similar grading treatment creating further harmony in both the use of colour and tone, which help the viewer's eye to roll around the various elements of the painting. A dynamic element to this particular image is the use of text. Text was often used in the paintings of Barques and Pablo Picasso sometimes to shape the meaning of the work, although sometimes seemingly meaningless. Through the muted colour scheme typical of Cubist works, this image gains a sober mood. The woman's eyes are apparently closed and there doesn't appear to be anything to indicate frivolity, although the guitar, suggesting music, could be interpreted as symbol of merriment. As mentioned, typical of Cubist paintings there is no sense of where the background ends and the subject begins or any formal elements of perspective like overlaying of subjects or shrinking into the distance. 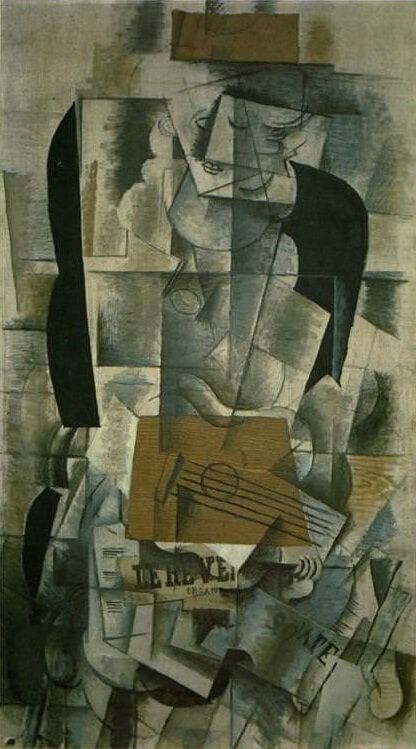 In this composition the viewer can see the experimentation of the Cubist style at play as the woman seems to be looking down to the guitar, out of the composition and also to the right suggestive of the multiple perspectives of Cubist paintings. 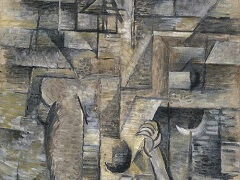 Thus in the limited palette that Braque has used combined with the fractured planes and mixed perspectives. 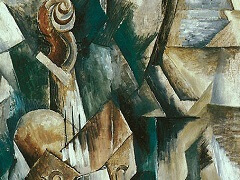 Woman with a Guitar is a perfect example of Cubist paintings.